Dentistry focuses on the treatment of oral diseases and conditions, with common treatments including fillings, restoration, extraction and implantation, root canals, and the treatment of abscessed teeth. Cosmetic dentistry; however, focuses on enhancing the appearance of your teeth, and common treatments include teeth whitening or bleaching, and implanting crowns, bridges, and veneers. Teeth whitening or bleaching is a non-invasive treatment that enhances the color of your natural teeth, eliminating stains and improving your smile. As the whitening is only successful on natural teeth, old fillings may need to be replaced after the procedure to match the correct level of whiteness. ZOOM teeth whitening is performed only by dental professionals, ensuring safe and effective treatment. Teeth whitening treatments that have not been proven by professionals may produce undesirable results; however, Zoom II is fast, convenient, and long lasting! Some at-home whitening systems work great if used properly. Most products come in the form of a mouth guard, designed to mold to your teeth. These mouth guards or trays are placed over the teeth usually before sleeping, for about 4-6 hours. Depending on the current color of your teeth, consistent application of the product continues for a few weeks to reach the desired whiteness. Your teeth may be extra sensitive for a few days following application, but this is just temporary and is a normal side effect. A dental bridge, is a fixed partial denture, which ‘bridges’ the gap between missing teeth. This procedure requires the cutting of adjacent teeth which are intact, which puts strain on the teeth. Sometime referred to as second permanent teeth, dental implants are extremely effective in replacing roots. Artificial roots, or fixtures, are connected to the dental crown and tooth head. 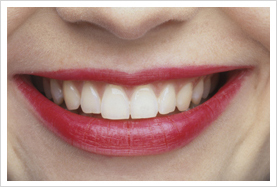 Traditional veneers require the removal of a portion of the tooth to make room for the veneer. Lumineer veneers, on the other hand, are incredibly thin, and they can be placed over the tooth without removing any portion of it. Since your original tooth is still intact, the procedure is reversible, there is no pain and no shots are required. Lumineer veneers are ideal for patients with cracks or chips, spaces, or slightly misaligned, shaped, or discolored teeth.